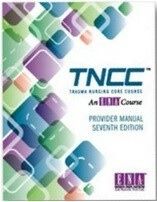 This 1-day re-certification TNCC course is to re-certify the experienced RN in trauma-already holding a current Provider certification card in TNCC. Must bring current Provider card to course. This course is testing only, no lecture. To register for this course please call the Flex Ed Office at (909) 464-2299. There will be a non-refundable, non-transferable prepayment amount of $200.00 due with registration. This non-refundable, non-transferable fee includes textbook and materials.